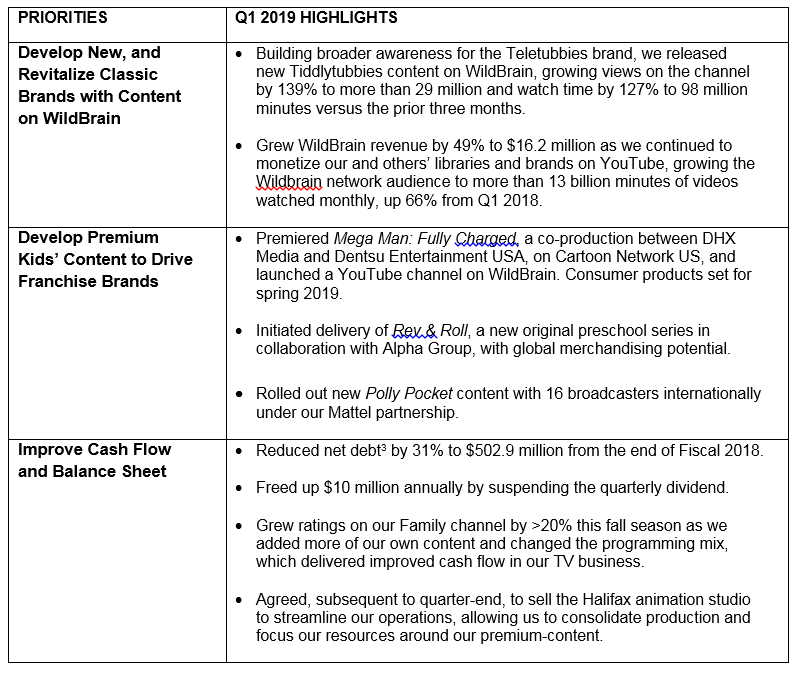 Halifax, NS – 13 November 2018 – DHX Media (or the “Company”) (TSX: DHX, NASDAQ: DHXM), a global children’s content and brands company, reports its Fiscal 2019 first quarter results for the period ended September 30, 2018 (“Q1 2019”). IFRS 15 – the IFRS 15 accounting standard was implemented in Q1 2019, which alters the timing of how proprietary production revenue and consumer products-owned revenue are recognized and also affects earnings. See note 3 in the Q1 2019 financial statements. Q1 2018 adjusted EBITDA and net income attributable to DHX Media for the 3-months ended September 2017 included the Company’s 80% interest in Peanuts Holdings LLC (“Peanuts”). In Q1 2019, the Company sold a 39% minority stake in Peanuts to Sony Music Entertainment (Japan) Inc. (“Sony”). Accordingly, Q1 2019 adjusted EBITDA and net income attributable to DHX Media for the 3-months ended September 30, 2018 reflected the Company’s 41% interest in Peanuts. Net debt includes long-term debt and obligations under finance leases plus bank indebtedness less cash, and excludes interim production financing. See note 15 in the Q1 2019 financial statements. The net leverage ratio calculation is based on the definition in the Company’s senior secured credit agreement available on SEDAR at www.sedar.com. Source: World Bank, United Nation, YouTube Analytics – based on monthly unique users on WildBrain’s top 200 channels (July to September 2018). Gross Margin means revenue less direct production costs and expense of film and television programs produced (per the financial statements). Adjusted EBITDA represents income of the Company before amortization, finance income (expense), taxes, development expenses, impairments, share-based compensation expense, acquisition costs and adjustments for other identified charges. The definitions of Gross Margin and Adjusted EBITDA are included in the “Non-GAAP Financial Measures” section of the Company’s Q1 2019 Management Discussion and Analysis. Q1 2019 revenue of $104.0 million was up 5.5% over the same prior-year quarter. The increase was driven by continued strong performance in WildBrain, higher consumer products royalties derived from our owned IP, and higher production service revenue. This was partially offset by declines in other business segments. The implementation of the IFRS 15 accounting standard reduced revenue by $2.4 million in Q1 20191. This revenue is expected to be recognized during the remainder of Fiscal 2019. Gross margin was 41% in Q1 2019 compared with 44% in Q1 2018. The decline was largely attributed to a higher proportion of service revenue in our studios, and increasing share of revenue derived from WildBrain. These factors were partially offset by higher margins in the television business, as we benefited from improved ratings and using our large library to control content programming costs. For Q1 2019, adjusted EBITDA was $17.3, compared with $22.8 million in Q1 2018. Adjusted EBITDA in Q1 2019 was reduced by $1.0 million due to the implementation of IFRS 151 and by $3.8 million related to the sale of the minority stake in Peanuts2. Q1 2019 recorded a net loss of $2.4 million versus net income of $8.1 million in the prior year quarter. The decline was in part due to a larger non-controlling interest in Peanuts due to the Sony transaction and a non-cash write-down in deferred financing charges related to the debt repayment. During Q1 2019, net debt3 declined by 31% to $502.9 million from the end of Fiscal 2018, as the net proceeds from the Sony transaction were used to pay down a portion of our term loan. Subsequent to quarter-end, we reached an agreement to sell the Halifax animation studio, which is expected to close on or about December 31, 2018. The transaction is in line with our focus on developing premium content, streamlining animation production and realizing operating efficiencies. We continued to see strong demand for our library shows. Amazon Prime Video recently licensed, non-exclusively, 10 of our kids’ shows in Spanish for its streaming service in the US. Seasons 1 and 2 of the live action preschool series, Waffle the Wonderdog, was picked up by Germany’s national public broadcasters, ZDF and KiKA, and also by 12 other broadcasters internationally. The Peanuts franchise continues to expand internationally and to broaden its demographic reach. UK retailer Mothercare recently introduced a Peanuts baby line with more baby collections targeted for spring 2019, as a result of initiatives to increase penetration in the Baby category. In Brazil, the first Peanuts Café opened in Sao Paulo, with more planned in the coming months. CPLG continued to expand its third-party representation by securing rights to Archie Comics, the Dr. Seuss franchise, and Asian social media brand Line Friends in Europe. CPLG also agreed to extend its footprint into Russia with a 49% stake in Moscow-based Pullman Licensing. As well, CPLG agreed to renew its representation of Nickelodeon for a further five years for all Nickelodeon’s brands, adding Russia to our existing network. DHX Media Management will hold a live webcast and presentation with slides for analysts and investors on November 13, 2018 at 8:00 a.m. ET, at the following address: https://event.on24.com/wcc/r/1871180/0A5B488CDD2FB7514ECFC1907820E6E6. To listen by phone, please call +1 (888) 231-8191 toll-free or +1 (647) 427-7450 internationally and reference conference ID 7071559. Please allow 10 minutes to be connected to the conference call. The presentation for the call will also be posted to the Investor Relations section of our website, at: http://www.dhxmedia.com/investors/. Instant replay will be available after the call on +1 (855) 859-2056 toll free, under passcode 7071559, until 11:59 p.m. ET, November 20, 2018. This press release contains “forward-looking statements” under applicable securities laws with respect to DHX Media including, without limitation, statements regarding progress on the Company’s strategic priorities, the effectiveness of the Company’s management team, the sustainability of the Company’s organic growth, the expected growth of WildBrain, expected use of available cash, cost rationalization initiatives and expected results therefrom, the markets and industries in which the Company operates, the business strategies, key priorities and objectives, and operational activities of the Company and results therefrom, and the future financial and operating performance of the Company. Although the Company believes that the expectations reflected in such forward-looking statements are reasonable, such statements involve risks and uncertainties and are based on information currently available to the Company. Actual results or events may differ materially from those expressed or implied by such forward-looking statements. Factors that could cause actual results or events to differ materially from current expectations, among other things, include the ability of the Company to execute on its business strategies, the ability of the Company to realize expected operating savings, consumer preferences, market factors, and risk factors discussed in materials filed with applicable securities regulatory authorities from time to time including matters discussed under “Risk Factors” in the Company’s most recent Annual Information Form and annual Management Discussion and Analysis, which also form part of the Company’s annual report on Form 40-F filed with the U.S. Securities and Exchange Commission. These forward-looking statements are made as of the date hereof, and the Company assumes no obligation to update or revise them to reflect new events or circumstances, except as required by law.